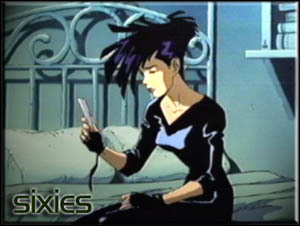 Welcome to Sixies.net, the home of the Cybersix Fans! This website's goal is to provide quality webspace to Cybersix fans and their websites, and keeping fansites dedicated to Cybersix alive for the many fans out there. Thanks for stopping by our little corner of Cyberspace, and we all hope you will enjoy your visit. If you see this update, then the move of sixies.net to the new webhoster, Ace-Host.net, has been accomplished. We moved the domain using domain parking, and a whole ton of re-directs so that all the links will either continue to work, or will be updated to reflect the new site. You should also note that certain sub-sites within sixies.net have been moved to subdomains of sixie.net. This reflects new capabilites that come with the new webhoster. If you are a sixie wanting webspace, go here for details on getting your own subdomain!. If you were a sixie who used to have webspace within sixies.net, I apologize for not getting in contact with you earlier: I moved all your stuff, and can give you your own subdomain and move your stuff into it. Go here for details. Many thanks to Frundock for updating the front door to sixies.net, to reflect the new domain! I'm still working on auto-redirection from www.sixies.org. Mille beaucoups, Frundock! We've been having problems with the webhoster for sixies.org. This site is now sixies.net, with temporary repointing from sixies.org. Updated links to reflect that Frundock's Cybersix site is now being hosted here at Sixies.org. The new www.sixies.org Front page goes on-line!